Since April 2009, Val was the AAPNZ National Finance and Membership Officer. Val held this position until her untimely death in August 2013 after 25 years with AAPNZ. Val joined the then NZ Society of Executive Secretaries Inc in Dunedin in 1985. She attained the NZSES Fellow professional designation in 1996 and was conferred with Life membership on 1 July 2006 at the AAPNZ Gala Dinner in Palmerston North. Val was involved in setting the criteria for the original Fellow and Associate designations and was involved in the criteria review. She has been a member of five groups – Dunedin, Hamilton, New Plymouth, Wanganui and Palmerston North (now Manawatu), and is a past president of both Dunedin and New Plymouth groups. As a member of Auckland Group, Val was involved on both this and Counties Manukau Group’s Management Committees. She also organised three of the Auckland region’s Administrative Professional Day Breakfasts. At a national level, Val was National Executive Committee (NEC) Honorary Secretary from 1991 to 1993, Group Representative on NEC, holding the education portfolio, from 1989 to 1991 and represented the Society on the NZQA National Advisory Committee for Business Studies from 1988 to 1993; it was here that the pathway for a system of accreditation for administrative professionals was first established. Val started her working life at a public accounting and sharebroking firm in Hawera where her role included completing financial accounts on an old Remington bookkeeping machine, sharebroking clerical work and shorthand/typing. By the time she left to marry, Val was supervising six staff. Husband Gary and Val have lived in many parts of New Zealand. Val has had a wide variety of jobs both in the private and public sector. These have included shipping manager/executive secretary at the now defunct Wilson Neill Exports (Dunedin), office manager/liaison officer for the NZ Commercial Travellers and Sales Representatives Union (Christchurch), PA/office administrator for two grain companies (Te Awamutu), sole committee secretary at the Taranaki Regional Council (Stratford) for eight years and while living in Waipukurau, committee secretary at the Hastings District Council. Nine years ago Val and Gary moved to Auckland, purchasing Quay Personnel where Val managed a team of up to eight recruitment consultants and opened two franchise offices. Unfortunately the recession hit the recruitment industry from mid-2008 with resulting downsizing and closure of the Newmarket office. Val then managed this business from the home office. 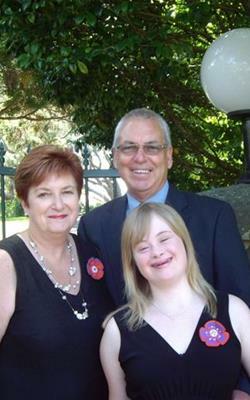 She was also secretary of the Auckland Down Syndrome Association for eight years – a voluntary role and association through having a grand-daughter with Down Syndrome. Family was very important to Val - four daughters, who live in Christchurch, Palmerston North, Stratford and London, five grandchildren. Val applied for the role of National Finance and Membership Officer with AAPNZ as it gave her an opportunity to learn new skills and oversee the financial and membership details of the organisation which she was passionate about. She always saw the organisation as the professional body for administrative professionals and was keen to see it promoted widely within the community and as providing many benefits to admin professionals who may work alone in offices throughout New Zealand. She was an advocate for administrative professionals who are in the main women, to acquire formal qualifications and recognition for their important role in the business sector.